The Old Testament books of Ezra and Nehemiah offer a timeless message of hope to Christians, reminding us that Jesus came to set us free from our own Babylonian captivity by becoming the true temple, living Word, and the One who is preparing a city where the walls are perfectly pure and secure. In this eleven-lesson Bible study, Sarah Ivill provides students of Scripture with an in-depth look at these two small books filled with great truths that will encourage them to trust that the good hand of God is on us. -An introduction that provides a big picture of the lesson, showing how it applies to your mind, heart, and hands. -A personal study section of questions that helps you dig deeply into God's Word. -A section that puts it all together, which aims to answer any lingering questions you may have after your personal study. -A section of questions for helping students study the Word of God in community. Click image for purchase info. “Many times, we read the Old Testament disconnected from the work of Christ. In her new Bible study, Ezra and Nehemiah: The Good Hand of Our God Is on Us Sarah Ivill helps us understand these books in their historical context, but also faithfully points us to the larger story—the one all the other stories point to—the redemptive work of Christ on our behalf. This guide will help you study Ezra and Nehemiah with new insight and application for how you think, what you love, and how you live. "Sarah Ivill has created a study that leads the student to discover the riches of the books of Ezra and Nehemiah and put them within the context of the redemptive-historical big story of the Bible. It will be of great benefit for the individual as well as group Bible studies." • An introduction that provides a big picture of the lesson, showing how it applies to your mind, heart, and hands. • A personal study section of questions that helps you dig deeply into God’s Word. • A section that puts it all together, which aims to answer any lingering questions you may have after your personal study. • A section of questions for helping students study the Word of God in community. "I am happy to commend these fine studies. Sarah is a sure guide—handling the text carefully, applying the Word wisely, and writing with an eye toward the edification of women in the church. The commentary and questions are marked by exegetical faithfulness and theological integrity. The church will benefit from Sarah's excellent work (and even more so, from God's holy Word!)." "Sarah Ivill has the mind of a scholar and the heart of a shepherdess. 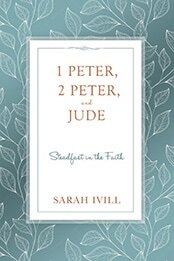 In this study of the letters of Peter and Jude, Sarah challenges readers to know more deeply the hope to which believers have been called. Sarah is bold yet gentle as she presents the truth of the text in a way that addresses the learner's head, heart, and hands. This study explores how the grace of God enables believers to stand firm in obedience, even when the circumstances of life are hard. In all situations, Jesus is 'our home, our hope, our holiness.'" "If you are looking for a study that highlights the attributes of triumphant heroes of the faith for us to imitate, this is not it! But if you want to be overwhelmed by God's faithful grace in the dark times of the Judges and the difficult personal circumstances of Naomi and Ruth, you will find much to treasure in this book." Iain M. Duguid, Author, Esther & Ruth (Reformed Expository Commentary) and Is Jesus in the Old Testament? "Sarah Ivill connects Ruth to Judges, allowing each book to enrich the other, and connects both of those books to the broad scope of redemptive history. She links individual texts to an abundance of scriptural passages and to systematic theology, always pointing to Christ. And she pairs Ancient Near Eastern backgrounds with plenty of contemporary application. A helpful resource for anyone studying Judges or Ruth or leading a study on them." "This is the first study guide to the book of Revelation that I can see using in our women's Bible studies...An inviting, effective tool to gain an understanding of this often-daunting book of the Bible." "Rich, rich, rich. Sarah's book on Revelation digs deep into the Word of God. She brings the whole of Scripture to bear in her expositions so that you truly see the unity of Revelation with the rest of the Bible." "Revelation can be an intimidating book to read. Its many complexities and pitfalls require careful navigation. But Sarah Ivill proves to be a steady guide, steering the reader through these difficult waters. In this study, she reminds us that the book of Revelation is not just some puzzle to solve or some code to crack. Rather, it is a wonderful and glorious vision of the persona and work of Jesus Christ. Thus, she helps us to see that Revelation is a book not just about the future, but also very much about the present." "The growing number of reformed authors who bring their love for the deep truths of God and passionate desire to see women applying His Word to all of life encourages me...[Sarah's] thoughtful exposition and theological gifts are evident in Hebrews—His Hope: the Anchor for our Souls. Come see the OT foreshadowings gloriously fulfilled in Christ Jesus. Come hear the writer of Hebrews call us to be faithful to Christ and Christ alone." 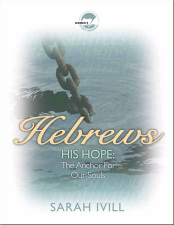 "Sarah's love for God and for His Word is evident as she leads her readers through the beautiful truths of Hebrews. The women in my Bible study have greatly appreciated the attention to detail and the practicality of the theology Sarah shares from Hebrews. Highly recommended!"